China's extremely varied cuisine is considered as one of the top three in the world. Chinese society greatly values gastronomy and a willingness to eat virtually anything edible, plant or animal. The first act of many emperors was to appoint a head chef to his court, and the competition between cooks could be fierce. Over time, techniques and ingredients from the cuisines of other cultures were integrated into the cuisine of the Chinese people due both to imperial expansion and from the trade with nearby regions. Styles and tastes also varied by class, region, and ethnic background. This led to an unparalleled range of ingredients, techniques, dishes, and eating styles in what could be called Chinese food. In Western meals, meat is often considered the main dish. This is in contrast to the concept of meals in China, where the starch, oftentimes rice or potatoes, is made the primary staple of the meal. Food is typically in bite-sized pieces, which are ready for directly picking up and eating. Traditionally it was considered ungracious to have guest have to work at cutting their own food. There is a portion of the Confucian influence, which considered using knives and forks at the table “barbaric” since these implements can be used and regarded as weapons. That is why chopsticks have become the tool of choice for eating. Though there is much mix and overlap in the types of cuisine in China, the major types can be categorized into eight major categories. You'll find a lot of stews and braised dishes from Anhui, with fewer stir-fried dishes than in other parts of China. The regional cuisine of Anhui in eastern China is considered to be healthy and visually interesting with simple flavors. Anhui cuisine is characterized by an ample use of fresh herbs, mushrooms, berries, tea leaves, bamboo shoots and other wild plants that grow in the region surrounding Huangshan Mountain. The methods used to prepare the dishes are simple, mainly consisting of braising and stewing. Special attention is given to the appearance, color, taste and temperature of the dish. 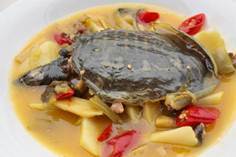 Some of the best known Anhui dishes include: Stewed Soft-shelled Turtle in a Clear Soup, Bamboo Shoots with Sausage and Dried Mushrooms and Stinky Tofu. Cantonese (Guangdong Cuisine : sweet, favoring braising and stewing, adding various sauces. Sichuan Cuisine : spicy and bold, using lots of chili, garlic, ginger, and peanuts. 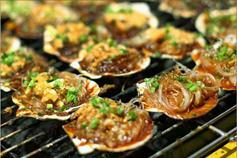 Shandong Cuisine : salty and crispy, favoring braising and seafood. Fujian Cuisine: light, with a sweet and sour taste, using ingredients from the sea and the mountains. Jiangsu Cuisine: fresh, salty and sweet, favoring soups and precise cooking techniques. Hunan Cuisine: quite spicy, favors sautéing, stir-frying, steaming and smoking. Anhui Cuisine: uses many wild plants and animals as ingredients, favoring stewing and more oil. 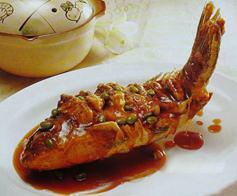 Zhejiang Cuisine: mellow, uses freshwater fish, seafood and bamboo shoots, and a wide variety of cooking methods. In Fujian cuisine, there is a big emphasis on broths and soups, as well as seafood. In fact, there is a saying in Fujian, that it’s unacceptable if there is not soup at a meal. This cuisine is noted for having choice seafood and the full breadth of tastes with sweet, sour, salty and savory. There is also a unique component to having a number of “pickled” tastes included in this regional fare. The most common ingredients include various types of seafood, including mussels, shrimp and fish. Pork, duck, chicken and beef are also used. 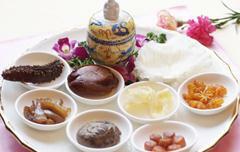 Some dishes get se fish sauce, shrimp paste, shacha sauce and preserved apricot. Typical Fujian dishes are prepared by first chopping the ingredients finely and then quickly boiling or stir-frying them or adding them to soup. In Fujian custard or orange juice is often used to bring a touch of sweetness to the dishes. Some of the most famous Fujian dishes include: The Monk Jumps Over the Wall, Fried Xi Shi's Tongue and Jade Pearl Abalone. The most commonly eaten type of Chinese cuisine outside of the mainland is Cantonese, since the vast majority of Chinese people living overseas are from Guangdong (Canton). The Chinese say that people from the southern province of Guangdong will eat almost anything that walks crawls, flies or swims. Being a coastal province means that there is a strong emphasis on seafood, although their way of seasoning the food sets them apart from other coastal cuisines Typical ingredients include different kinds of meats and vegetables, such as onion or garlic. The main seasonings are sugar and spiced salt. The rich flavor of Cantonese dishes is the result of using a variety of flavorful ingredients such as peanut oil, rice wine, anise, cassia bark, licorice root, ginger powder, dried tangerine peel, oyster sauce, fish sauce, clam oil and curry. The methods used to prepare Cantonese dishes are sometimes quite unconventional and include salt-roasting, steaming with wine and slow-cooking. Guangdong chefs also pay a lot of attention to the artistic presentation of dishes as they are served. The most famous Cantonese dishes include: The Dragon and Tiger Fight, Hong Kong egg custard tarts, wontons and spring rolls. Hunan in southern China is dominated by rolling hills and beautiful valleys, which provide a fertile ground for growing a wide range of crops, especially rice. 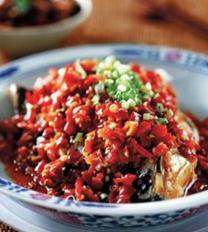 Hunan cuisine is famous for its spiciness, deep colors and fresh aromas. Smoked and cured foods are typical in this part of the country. The main cooking techniques include braising, stewing, smoking and steaming. Both Hunan and Szechuan cuisine make extensive use of chilies, to cleanse the palate and to cope with the humid climate. 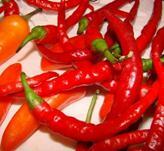 (Hot foods such as red chili peppers dry out and cool down the body, making it easier to handle the heat and dampness). Hu nan dishes are normally made with fresh chili peppers, including the seeds and membranes which contain most of the heat. 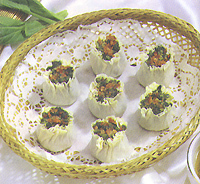 Elaborate preparation is a hallmark of Hunan cuisine. Orange Beef, made by marinating beef overnight, then marinating again with a mixture including egg white, wine, and white pepper, is a classic Hunan dish. So is Crispy Duck, made with duck that is seasoned with peppercorns, star anise, fennel, and other spices, then steamed and finally deep-fried. 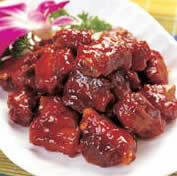 The most famous Hunan dishes include: Dong'an Chicken, Crispy Duck, Orange Beef and Spicy Frog's Legs. 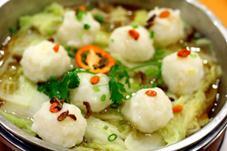 For elegant braised and stewed dishes, one can look to Jiangsu cuisine. Jiangsu cuisine is known for its duck recipes. This food is generally characterized by light and fresh flavors and tender textures. Sugar is often used to round off the flavors. More often than not the dishes are carefully arranged to make a visual impact. Jiangsu Province is noted for various kinds of snacks, with vegetable or meat filling, beautiful shapes and delicious tastes, such as Sanding Steamed Bun, Suzhou Glutinous Rice Cake, and Dumpling with Juicy Crab Meat Filling. Famous examples of typical Jiangsu dishes include: Jinling salted dried duck (Nanjing's most famous dish), crab shell meatballs (pork meatballs in crab shell powder), Yangzhou steamed Jerky strips (dried tofu, chicken, ham and pea leaves), Farewell My Concubine (soft-shelled turtle). 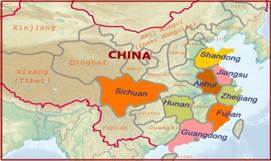 The Shandong peninsula in northeast China has an emphasis on salty and garlicky foods. There are a lot of soups, noodles and seafood - but not much in the way of sweets. 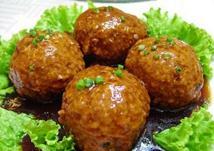 It's a very wholesome fare, and was once the favorite of the royal court, because of its closeness to Beijing. One of the main characteristics of this type of cuisine is the tendency to eat bread instead of rice and the use of onions as a seasoning. Millet, wheat, oat and barley are used to make a variety of delicious breads. Common vegetables include potatoes, tomatoes, cabbages, mushrooms, onions, garlic and eggplants. Roasted or salted peanuts are also often used to add a bit of crunchiness and flavor to dishes. Typical Shandongese dishes include lightly seasoned seafood, soups, and stir-fried, braised and deep-fried foods. The most popular Shandong dishes include: sea cucumber with meat balls, braised shark’s fin with shredded chicken and bamboo shoots. If you eat Sichuan food and find it bland, then you can conclude that you are not eating authentic Sichuan cuisine. Chili peppers and prickly ash are used in many dishes, giving it a distinctively spicy taste, and often leaves a slightly numb sensation in the mouth. Sichuan cuisine uses a lot of freshwater fish, and also chicken, duck and pork. Shark fins, bear paws and some other unusual ingredients are also used. Typical spices include Sichuan peppercorns, chili, ginger juice and soy sauce. It is mainly prepared by stir-frying, braising or stewing. Sichuan hot pots are perhaps the most famous, the most well-known of which is Yuan Yang (mandarin duck). 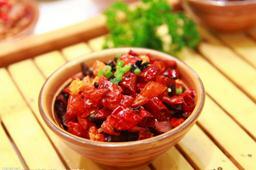 The most popular Sichuan dishes include: Kung Pao chicken, Twice Cooked Pork and Tea Smoked Duck. Ningbo cuisine, which is generally described as being very salty, is the best known subcategory of Zhejiangese cuisine. Seafood is very popular here, but spices are used quite sparingly. Since this southern province is bamboo country, almost every dish contains bamboo shoots. Zhejiang dishes are usually prepared by stir-frying, braising or steaming. Meat is often marinated in a mixture of vinegar and sugar. The most famous Zhejiang dishes include: Dongpo Pork and Shelled shrimp in Longjing tea.